The uninitiated – that is, non-gardening friends – often say things to me that make me giggle. Things like, “you must be glad it’s autumn, you won’t have to be in the garden so much”. It got me thinking though that my busiest times are usually spring and autumn, preparing for the frenzy of summer and the hard graft of winter, when I’m more inclined to do heavy building work to keep warm, while trying to grow winter food. I feel there’s always things that should be done no matter the season and, dealing with a physical disability, things that I have to take a long view on completing. One such job has been The Corner of Shame. I think every largish garden has one, that back corner, usually furthest away from the house, that gets overgrown and forgotten about because there’s so many other things that take your time and attention before you can walk that far! Well, after months (literally) of chipping away at it, my Corner of Shame is no more! The picture above shows the now Corner of Care that was started as a long term project by two of us in November last year. 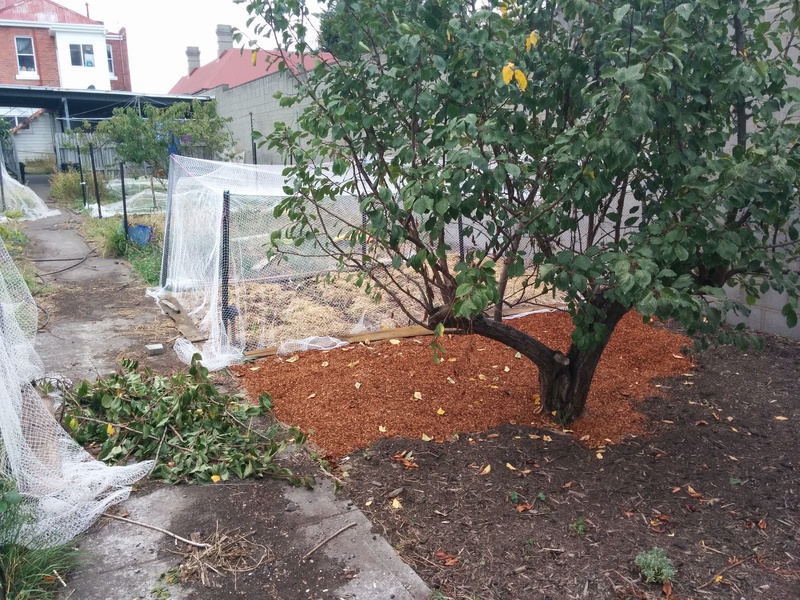 I had to get a second load of pine bark to finish top dressing around the plum tree and opted this time for the fresh rather than the composted, darker mulch. 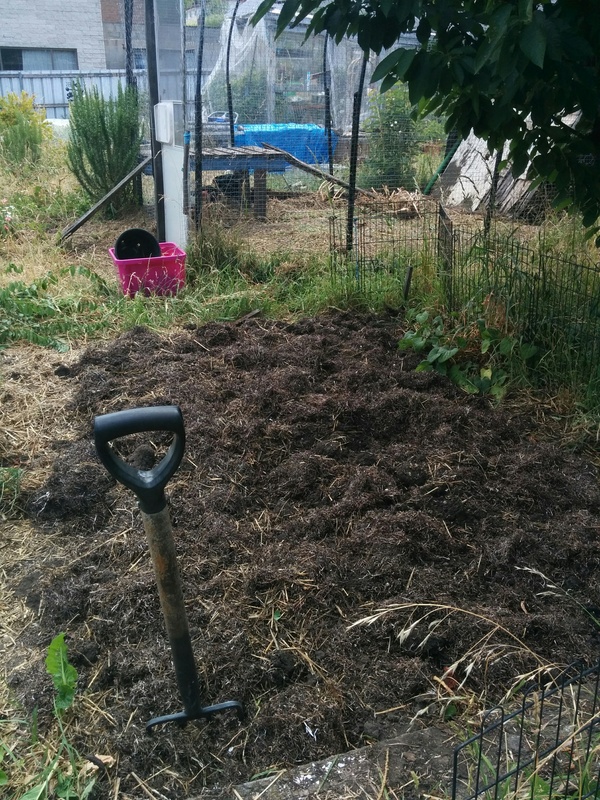 Also, I’ve planted an English Lavender (in the bottom right corner of the photo) and started pruning the plum tree. The netted area is half a huge bed that I left fallow for a season and built up with compost from the chicken coop, spent straw from rabbit hutches and a few good handfuls of dolomite. Last weekend I planted leeks, silverbeet (chard), celery and some bunching broccoli in there and this weekend I finished it off with garlic. Next weekend, I’ll be doing a similar netting job on the other side but I’ll be waiting for a few more weeks for the next round of seedlings to be big enough to plant out. 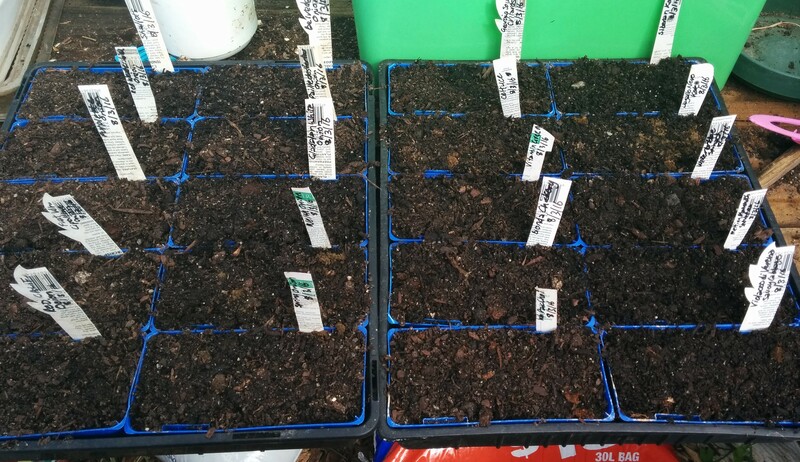 The two nursery trays above (ten punnets of winter vegetables and ten of onion varieties) were planted on March 8th, only six days ago. This morning, nine of the winter vegetables were up and big enough to handle and six punnets of the onions. Hopefully, I’ll get some time during the week to prick some of the kale, savoy cabbage and endive seedlings into toilet roll grow tubes and get them ready for planting out across five beds before the soil starts cooling off! The other long term project I’ve brought to a close in the last few weeks has indeed been a labour of love. 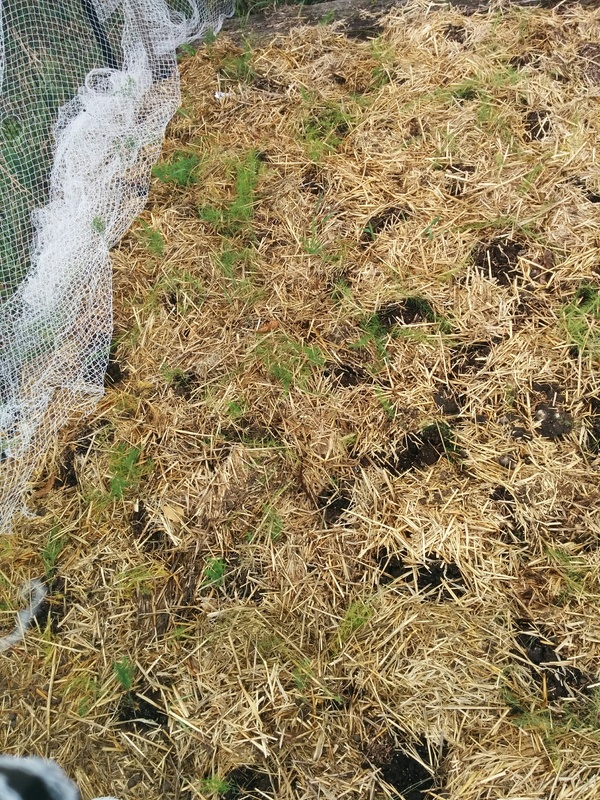 My all-time favourite vegetable is asparagus and at the beginning of spring, I took the plunge and planted some seed rather than wait until winter and buy (in my opinion) very expensive crowns. Asparagus seed is notoriously difficult and has a very short shelf life but either I chose well or got lucky – probably a little of both! 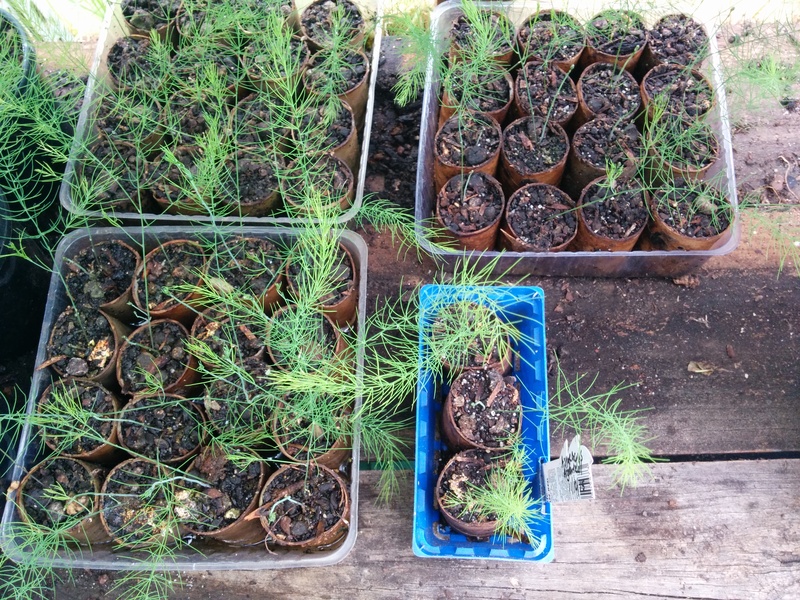 I ended up with 51 asparagus seedlings!!! In the meantime, I spent quite a bit of time teasing out the little seedlings into individual grow tubes as you can see from the picture below. Finally, a seriously diseased cherry tree had to be taken out from behind the bed before I could plant my babies out. Thanks to my wonderful son and other family members, I had some help with this and didn’t do anything my doctor wouldn’t approve of! And then, at last I started planting these precious little seedlings out. It took me a few weeks to get it all done but they’re doing well – all 51 of them!!! At the moment they’re very tightly planted but as the crowns grow I’ll take over the rest of the bed and give them more space to grow. Asparagus is dioecious – it has male and female plants – and I’ll be removing most of the female plants as I work out who’s who. Male plants don’t have to expend resources to produce fruit, so can crop up to three times more than a female plant. What’s your favourite vegetable and how do you like to eat it? 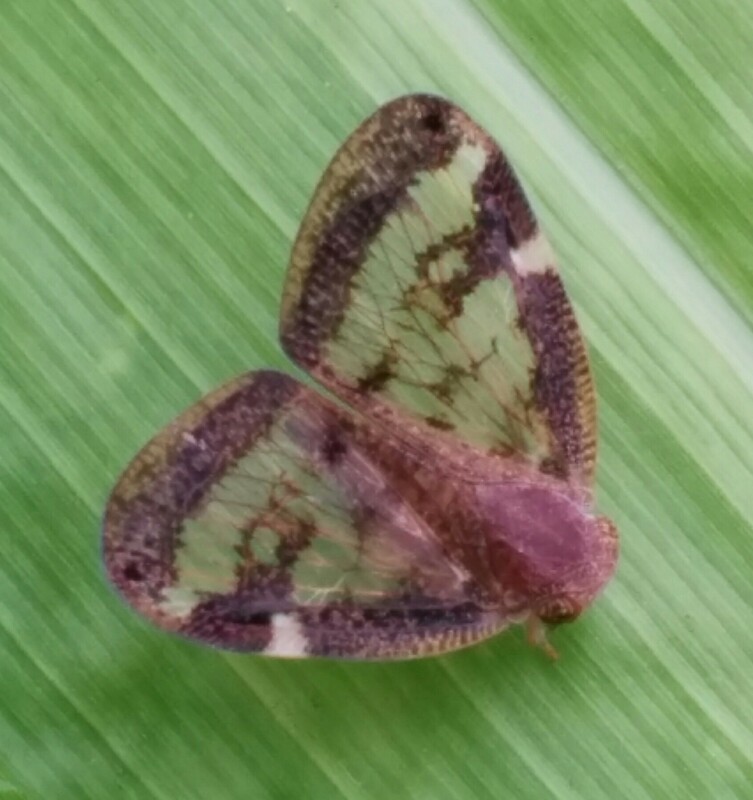 Please leave a comment – I love to hear your stories! Previous Autumn Love Next Plants From Prunings – More Autumn Jobs! Yes, I often find I’m planting out the wicking boxes on my balcony very late in the season and find I rely on the self-sowing salad veg when I’m really busy in autumn! While I love the idea of more asparagus for everyone, it’s another reason to remove female plants – so it doesn’t become a weed in bushland. Asparagus! That’s dedicated and I don’t think I will ever plant it, as my stomach doesn’t like it that much. A couple of serves when the season comes around is usually enough of a reminder. I love salad greens, though. Many, such as rocket, self seed and there always seems to be something to pick, no matter how weedy the garden gets, even if it’s just nasturtium leaves.